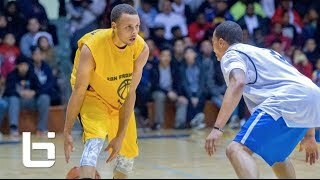 Here's raw footage of Golden State Warriors Stephen Curry dropping 43 points in his SF Pro Am Debut! Added: By: Ballislife West. Duration: 3:34. Channel: Sports. Here's raw footage of Golden State Warriors Stephen Curry dropping 43 points in his SF Pro Am Debut! Tony Wroten LOSES Defender W/ One of the SICKEST Shamgod Crossovers EVER If Not The Best! !